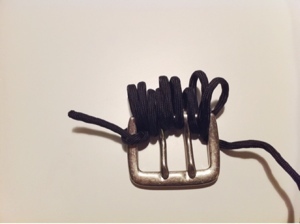 After writing the post on How to Make a Slatts Rescue Belt, I’ve had a number of requests come in for instructions on how to start the Slatt’s Rescue Belt knot on a belt buckle. So I thought I’d take some time in this post to explain/show how that’s done. Since it’s kind of difficult to see the details of the paracord, I mixed it up a bit showing examples of the process with some thicker rope attached to a handle (to represent the belt buckle). Hopefully those images will help you see the process a little better. Step 1: The first thing I do to get the slatts-rescue-belt knot started on a belt buckle is to put a thick marker (or any marker-shaped object) above the buckle. 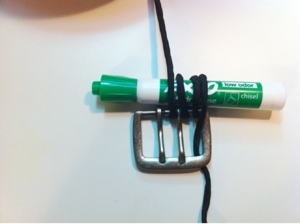 Step 2: Then, I begin to wrap the paracord around both the buckle and the marker. I continue the looping process until I’ve reach six loops around both the marker and the buckle. 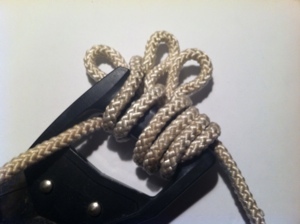 Notice that there is a length of paracord trailing at the beginning of the loops. This will later be tied off and burned so that it doesn’t come undone. It helps — at least initially — to tie this off to something stable (not visible in the photo). Step 3: After the six loops have been created, pull the marker out until you are left with just the six open loops. 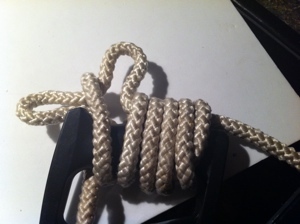 Step 4: (So that you guys can see this better, I’ll switch views to the large rope and saw handle). 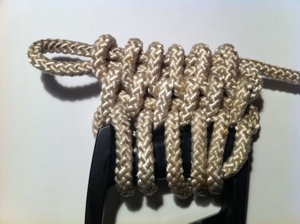 With the six loops open and leaving a gab between the paracord and the buckle (again, in this case a handle), tunnel a bight (a loop) through all six loops until the first loop peeks out through the end. 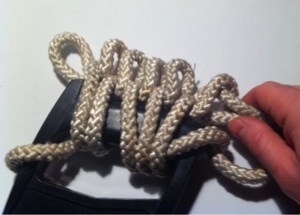 Step 5: From in-between each of the six loops, begin to pull the standing part of the rope (the source of rope that you fed into the six loops) out until it forms the second small loop. Step 6: Continue with the third loop (as shown in the photo) and onward until there are six loops. Step 7: As in step 4, tunnel a bight through all six loops that were created in the previous step. Step 8: Repeat steps 5 through 7 again. Step 9: Continue the steps above and watch your belt grow! When you’ve reached your desired length you will have trailing cords at both the beginning and the end. To get rid of these, what I like to do is weave them back into the belt and when there’s only a small piece extruding, I’ll melt this piece down with a lighter and flatten the melted tip into the belt. Hope this helps! Be sure to comment with any questions you may have. I have one of these awaiting buckles currently sitting beside me. I only did 4 loops wide, used up 75ft in 3ft 5inch belt. I also used a skate lace tightener to get the weave tight. Great idea with the skate-lace tightener. I think I’ll have to incorporate that in the next project. Hello, been trying this for a few hours now (grrr), and I can’t avoid getting twisted kinks in the paracord as I pull each row thru. How do you avoid the cord getting twisted? Hello, how do you keep the paracord from twisting? I keep getting a tangle of cord that I can get straightened out. Any help would be appreciated. 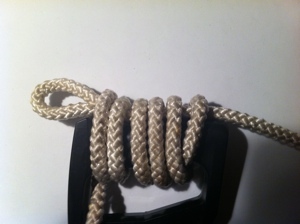 Yeah, paracord has that annoying quality especially when doing the Slatt’s knot. I had to continually do a counter-twist during each run of the stitch to keep it under control. Just a quick question, and maybe you’ve covered this elsewhere, but for a belt that you’re planning to carry everywhere, it seems as though it isn’t sturdy enough to secure a handgun to. How are you going to clip your pistol to a bunch of paracord? Actually the belt is stronger than any leather one that I’ve had and would easily accommodate a belt holster without issue. For me though, I’m a long-time user of the Smart Carry holster which doesn’t require a belt (and is great for gym shorts when you don’t have a belt). Skate lace tighteners can be found on Amazon here: Lace Tightener. They are for tightening down hockey skate laces and work well on paracord. Way to go on making all that stuff and teaching the young ones. It’s a great skill. As for printing, you should be able to go to your browser and click File -> Print. I’m still working on how best to format it. you have to take the slack out of each run and twist it as it comes out. when you do this, you end up with a tighter weave, and a much nicer finished look. i do a 6 loop weave with 100′ of paracord and it is approximately 40 inches long. Thanks for this article. I was pulling my hair out trying to figure out how to attach a buckle. This article gave me the thing I missed. Something to make loops with. Hey, I’m new to all this so apologies if this is a dumb question. 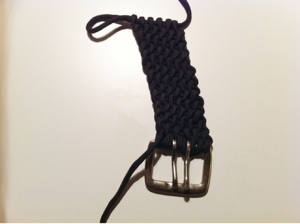 I saw a comment on the first Slatt’s rescue belt (http://www.tacticalintelligence.net/blog/slatts-rescue-belt.htm) about using two shackles to make a double d-ring type belt out of this weave. I’m wondering if you could use two carabiners to function as the double d-ring. Given this is a “worst case scenario” belt would it be helpful to have some carabiners along for the ride? Would the design still work? 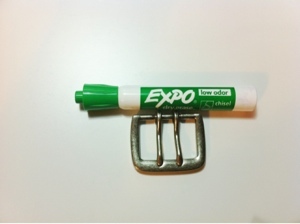 I’m thinking you would follow the same process that is used for attaching a normal buckle, but just do it twice. Does that seem possible? This might have the downside of making it a bit slower to unwind, which could be disastrous in an emergency. On the other hand, maybe it doesn’t add that much time and it has the benefit of giving you two ‘biners. Thoughts? Also, thanks for the great tutorial. I think it would be totally doable. Keep in mind, you can always cut near the carabiners to start the unwinding if it binds up on you. Try it out and let us know! Awesome. Thanks for the quick reply. I still need to order everything, but I’ll let you know how it goes when all is said and done.